Two years passed and there was no sign of Casey the Schnauzer. The dog went missing and his frantic owner had just about given up hope on ever seeing her beloved dog again. 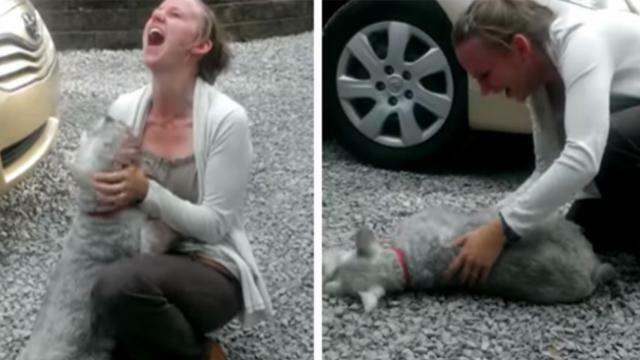 Amazingly, the lost dog was found and reunited with his very grateful mom. The Schnauzer was so overcome with emotion, that he appeared to pass out. During the time Casey went missing, his mom worked and lived in Slovenia. She came back to her hometown in Murrysville, Pennsylvania, where this joyful reunion occurred. The moment Rebecca and Casey saw each other, tears began to flow, the dog squealed with joy, and his mom could hardly control her emotions. As they cling to each other, you can feel the love and gratitude between them. Suddenly, Casey leans to the side and appears to pass out. Is it from the emotional reunion? Is he beside himself with glee? The perky pooch was simply full of exhilaration and it got the best of him. He was taken to a veterinarian who watched the video, checked him out, and said the dog is fine.